Productions by Recent Cutbacks are among my favorite things to see while in New York City. Made up of hardworking and talented individuals, Recent Cutbacks has changed the way I view theater. If you have decent taste and like things that are awesome and fun, I’m 100% confident you’ll love Recent Cutbacks’ latest offering – a hilarious Home Alone reenactment titled KEVIN!!!!! I first experienced Recent Cutbacks’ unique brand of bare-bones theatricality with the critically acclaimed Hold On To Your Butts, a Jurassic Park parody that will go down in history as one of the best things I’ve ever seen in my 28 years as a New Yorker. Along with director Kristin McCarthy Parker, Recent Cutbacks members Nick Abeel and Kyle Schaefer consistently strike gold, delivering production after production full of heart, comedy, sweat, and chest hair, and KEVIN!!!!! has proved that they’re still on top of their game. 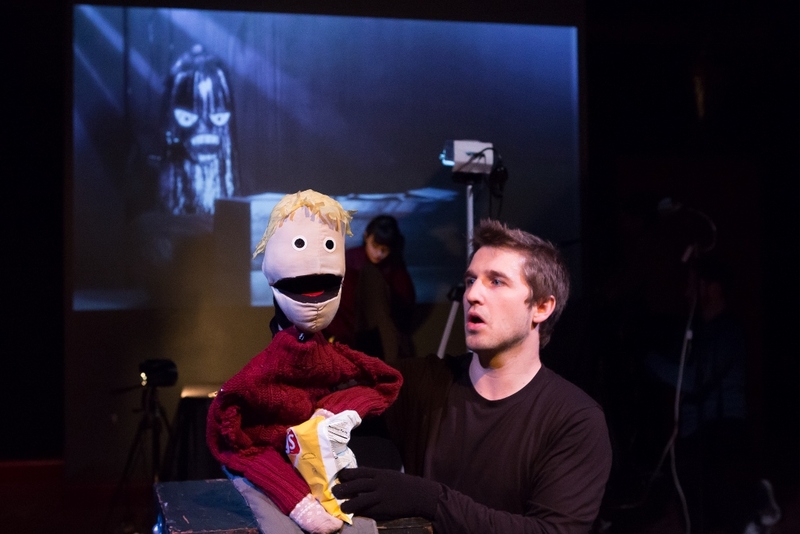 Combining screen projection, puppets, and a four-person choir, KEVIN!!!!! is the collective’s most ambitious undertaking yet. 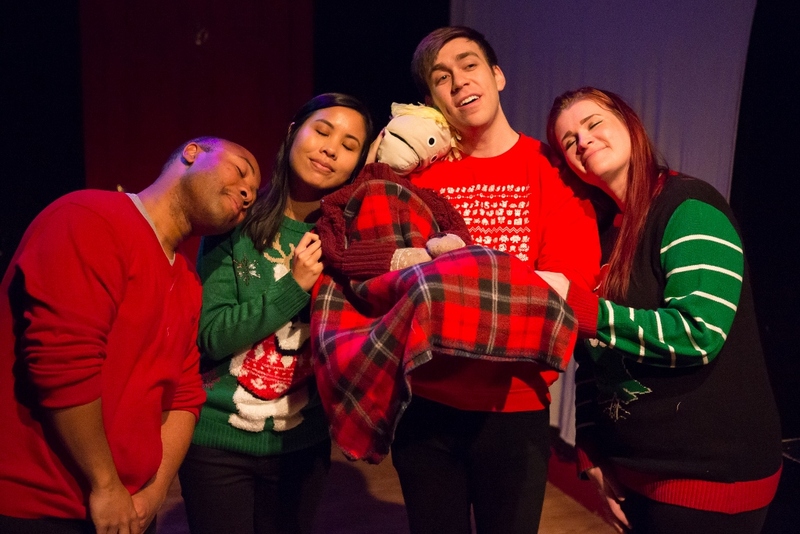 Sarah Godwin, Richard Sears, Michelle Vo, and PUFFS alumnus Evan Maltby took the stage at The Peoples Improv Theater with the pipes and holiday sweaters befitting of any choir serenading the audience of a Home Alone reenactment – and hold on to your butts (and your hats) because they can sang. A welcome and pleasant surprise, this quartet (which included my favorite Puff!) contributed sound effects, comedic relief, holiday classics, and that oh-so-familiar score during tense moments. Speaking of tense moments, what would a Home Alone parody be without the addition of Harry and Marv, everyone’s favorite bumbling burglars? Natalie Rich and Sonia Mena joined the KEVIN!!!!! cast to play several characters including the gruesome twosome, and they do it well. The great thing about Recent Cutbacks is that only a genuine passion for the films portrayed – from Jurassic Park to Lord of the Rings to Home Alone – could produce such loving parodies. There is no doubt in my mind that Nick and Kyle probably didn’t need a script at all when thinking of lines to use for KEVIN!!!! !, and it seemed as if Natalie and Sonia were just as effortlessly able to weave between characters with zero hesitation. The screen projection and puppetry was cool, impressive, and well-crafted, but I must say that I did find myself enjoying the live-action parts of KEVIN!!!!! a bit more. This cast is so talented at what they do, and it really is an enjoyable experience to watch them. Also, I’m currently petitioning for Kyle’s beard to have its own bio on the program. Happy holidays, you filthy animals. Hold on to your butts – and then get them over to The PIT to see KEVIN!!!!!. You won’t want to stay home alone for this one. KEVIN!!!!! 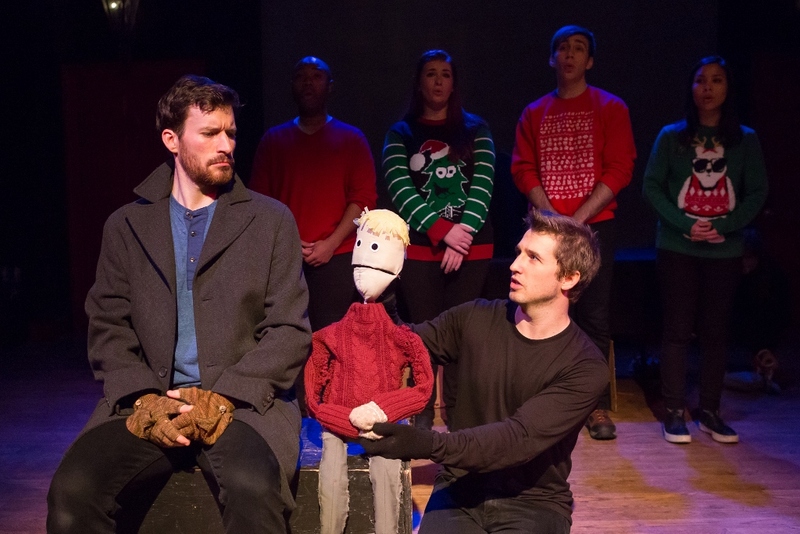 is currently scheduled to run through Jan. 7 at The Peoples Improv Theater in New York. For more information about Recent Cutbacks and to purchase tickets, please visit one of the links below.